Reading/signing, hosted by the Shropshire Rainbow Film Festival, at Two Fat Rascals Café, Riverside Precinct, Pride Hill Shopping Centre on IDAHOT, 17 May, 2 to 4pm. 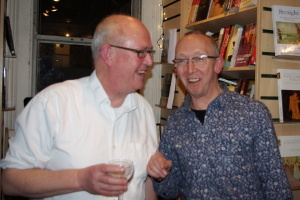 The London launch was held on Thursday 5 March at Gay's The Word bookshop, 66 Marchmont Street London WC1N 1AB. Our photo shows Peter with Jim MacSweeney, owner of Gay's The Word. Amiable Warriors was launched on Valentine's Day, 14 February 2015, as part of the Festival of LGBT History in Manchester. Peter-Scott-Presland gave the kenote address at the academic conference associated with the festival. You can read the text of his address here. 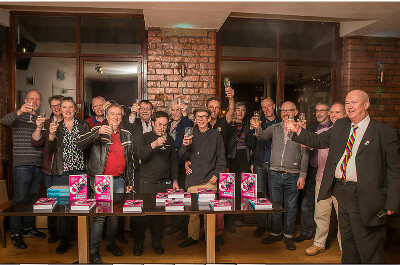 Our picture shows supporters celebrating at the launch event, with Peter Scott-Presland extreme right (Photo credit: Nicholas Chinardet ).